Our team is all time looking for innovative SEO solutions! And after long research, we would like to present you an awesome and brand new gig from CrorkService. 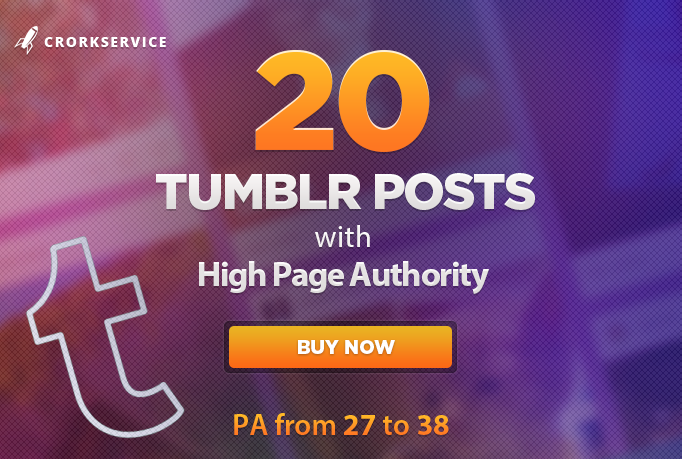 We have a large Tumblr blog network, in which all blogs have page authority from 27 to 38, isn't this amazing? From your side You will have to provide 20 articles for this service. If you don't have articles, you can buy them in our extrases. If you want to post more articles, just order Extras for 50 blog posts. All articles written by our team, will be SEO optimized considering your keywords and in each article will be 1 backlink to your website. Articles will be 400-500 words long. Do not hesitate and Order Now to increase rankings if your website! Your 20 articles - please give us link to archive via dropbox. If you don't have, please order in extrases.